Oil sample analysis measures wear metals and dirt, detects water, fuel and antifreeze in oil, measures soot, oxidation and sulfur contaminants. Many companies evaluate oil composition, but interpreting the results is the key to effective engine management. 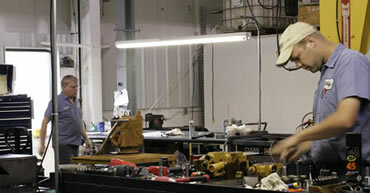 We understand your engine, so we can interpret findings and diagnose problems quickly and accurately. Sample at consistent intervals to detect potential problems early. Oil Sampling- Oil sample analysis measures wear metals and dirt, detects water, fuel and antifreeze in oil, measures soot, oxidation and sulfur contaminants. Many companies evaluate oil composition, but interpreting the results is the key to effective engine management. We understand your engine, so we can interpret findings and diagnose problems quickly and accurately. Engine Coolant Sampling- Over 40% of all engine failures can be traced to the cooling sytem. Ohio CAT's Fluids Analysis Lab's coolant analysis program monitors glycol, supplemental coolant additives, pH levels, conductivity, metal corrosion and other impurities.